Today is a super late post because I've been at the gym! I ended up going with one hand polished and one hand naked nails because I was going to swatch one of my new polishes to show you tonight but I really wanted it to be in the sunlight and I didn't have my camera with me when it was sunny because I was at the supermarket! I got this nail mail on Thursday afternoon after an infamous attempted delivery slip arrived at my house on Wednesday, story of my life! I was just expecting the one parcel because I only got one slip but I had two packages secured onto a box with elastic bands! So almost everything I was waiting for! One online order and two of my three remaining swaps. See individual pictures of each polish by group after the jump! I found a store on eBay that had a ton of different polishes at really cheap prices based in New York. 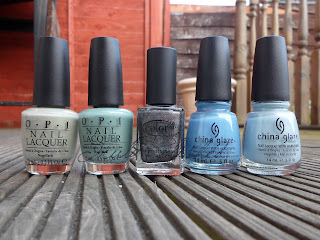 I got these OPIs, China Glazes and the Color Club for about £3/4 each! I couldn't say no for that price! 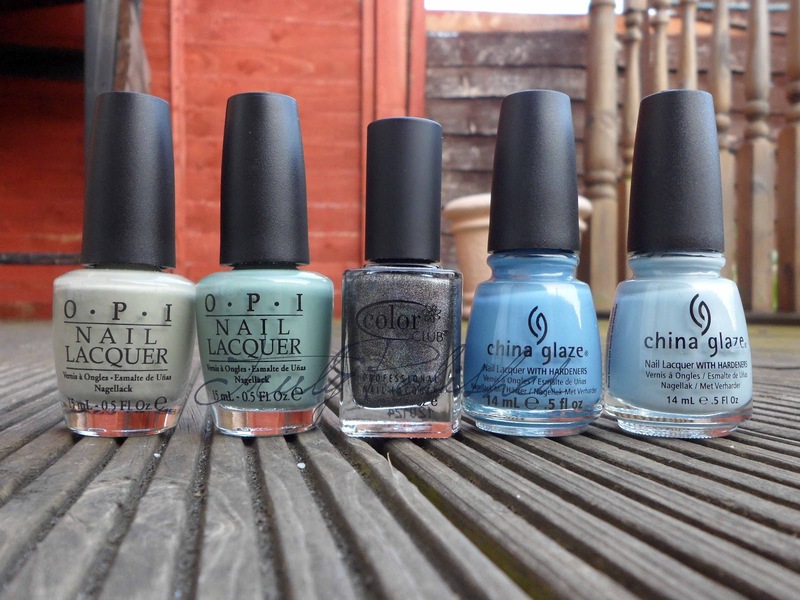 I got OPI Stranger Tides and Thanks a WindMillion, Color Club Revvvolution, and China Glaze Electric Beat and Sea Spray. This spring I'm a sucker for muted greens and blues and these are perfect, and as for Revvvolution, I can't turn down a holo! Thanks a WindMillion is what I had lined up for today's post, so weather permitting it might be coming up tomorrow, definitely this week sometime. I also got a swap package from Liz, who's a polish buddy of mine over in Colorado, I sent her a few bottles of Max Factor's Fantasy Fire and she sent me China Glaze Smoke and Ashes (from the new Hunger Games collection) and OPI Russian Navy, which I've wanted for ages!!! Thanks Liz!!! My last package was from Taryn. I sent her some Fantasy Fire and in return she sent me Deborah Lippmann Lady Sings the Blues, which I can't wait to wear, thanks Taryn! Last but not least... I went shopping on Friday and saw this Color Club set in TKMaxx. It's supposed to be the Glitter Vixen collection but it's not... I couldn't care less though because the set included Covered in Diamonds from the 2010 Untamed Luxury Collection! I saw it and had to buy it just because of that after I almost paid a lot more for it on eBay!!! It only cost £7.99 so it wasn't too bad, and I'm sure I'll use the other glitters, even if it's just for frankens! It is so ridiculous how much polish I have to swatch!!! I'm travelling to see some friends and my boyfriend's family tomorrow so I'll have to take some with me! Enjoy Lady, Fay! It's such a beautiful color. I think you'll like it. Thanks again for a great swap. I love Fantasy Fire!